With the girls at home (school holiday) and the hubby at work and the sun not exactly making an appearance this morning, I decided to make some cookies. Pumpkin are a favorite in the house and I never got around to making them at Christmas time (boo me), so I figured now’s as good a time as any. But I didn’t want to frost them, I wanted to try something different. Well, not something spectacularly imaginative … I just wanted to add some chocolate chips (dark chocolate, thank you!). After checking out a couple of Pinterest recipes and other Google searches, I decided to use my tried-and-true Pumpkin-Pecan Cookies with Brown-Sugar Butter Frosting recipe (sans the frosting, of course). I always add fresh ground nutmeg (and this time I also added some ground cloves—oh, and extra pumpkin). The girls loved them, I thought they were so-so (I think they need salt). Once the hubby gets home and tries them we’ll see what he says. 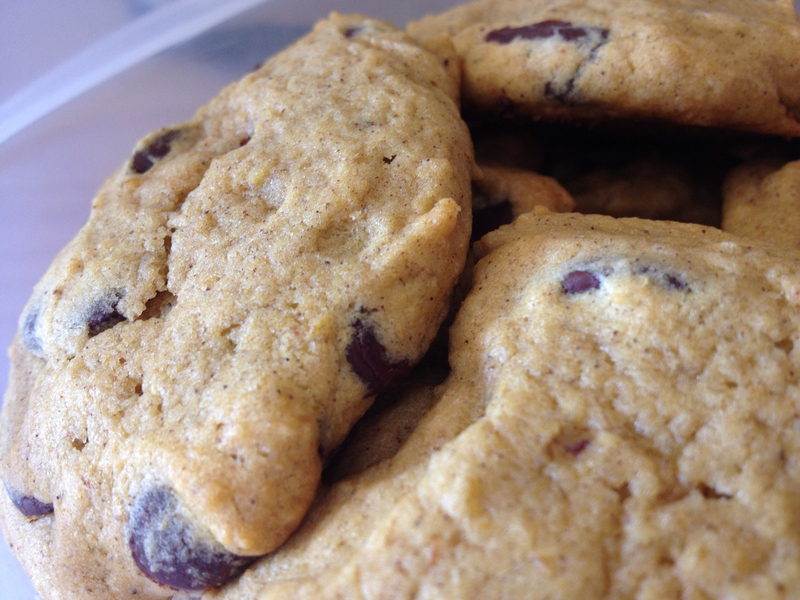 Next time I’ll try these Giant Salted Pumpkin Chocolate Chunk Cookies from the Picky Palate. Do you have a pumpkin chocolate chip cookie recipe that’s your go-to? Please share, I’d love to compare! 2. In a large mixing bowl beat the butter with an electric mixer on medium speed for 30 seconds. Beat in sugar. Add the egg; beat well. STir pumpkin and flour mixture into egg mixture. Stir in chocolate chips and/or chopped pecans. Note: I often cheat and use a hand mixer when I’m only baking one batch of cookies, rather than pulling out my stand mixer. 3. Drop the dough by rounded teaspoons (I made these extra large at about 1/4 C) about 2 inches apart onto ungreased cookie sheet. Bake cookies in preheated oven for 10-12 minutes (I baked the larger size at about 17 minutes) or until bottoms are lightly browned. Transfer the cookies to wire racks; cool. Frost cooled cookies with Brown-Sugar Butter Frosting. Makes about 24 large cookies/40 small cookies. In medium saucepan heat 6 T butter and 1/3 C packed brown sugar over medium heat until butter melts and sugar dissolves. Remove mixture from heat. Stir in 2 C sifted powdered sugar and 1 t vanilla. Add enough hot water (2 to 3 t) to make a smooth, spreadable frosting. Frost cooled cookies immediately after preparing frosting. If frosting becomes grainy, add more drops of hot water and stir until smooth. TO STORE: Place in layers separated by wax paper (or parchment paper) in an airtight container; cover. Store at room temp up to 3 days or freeze unfrosted cookies up to 3 months. Thaw cookies, then frost.